Sounds like free marketing to me, so what could be wrong with making this the centerpiece of your inbound marketing strategy? We’ll get to that in a minute. First, let’s examine some more benefits of working with LinkedIn groups as part of your content marketing strategy. Like most social networking groups, the primary goal of a LinkedIn group is to build a hub for quality discussions and feedback. 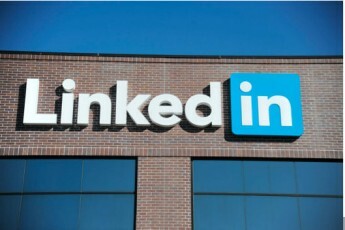 LinkedIn is a professional network, focusing on B2B interactions. That means the quality of the contacts you’ll get for any business-related content is much higher than those from Facebook or Twitter. This provides content marketers with the opportunity to really get their posts in the hands of the right audience without having to pay for them. Rather than hash out money for ads, you can directly target groups that your content will appeal to organically. Although it may seem like a simple and obvious content marketing strategy, managing content distribution across multiple LinkedIn groups means dedicating a great deal of time and effort on reading what others post and on sharing your thoughts within those discussions. There are many rules for content marketing on any social platform, and LinkedIn is no exception. To find success on this platform, you will need to avoid click-bait marketing and focus more on creating high quality posts. Unfortunately, not everyone follows this advice. A major problem for many LinkedIn groups is the amount of spam or self-promotional materials posted by marketers and other content creators hoping to drive traffic to their websites. Because some groups have thousands of members or more — and are therefore filled with potential readers and customers — they are ripe targets for spammers, as well as for well-meaning content creators who just want to spread their messages as far and wide as they can, without due concern for where it gets placed. This results in dozens of posts with self-promoting links showing up that do not speak to the group’s purpose or to its primary interests. A side effect of this is that the relevant, high-quality discussions that are posted to the group’s pages end up getting pushed down and diluted among the spam posts, making it less appealing or enticing for group members to find posts worth interacting with. Too many emails from groups can dissuade people from reading your posts at all. 1. 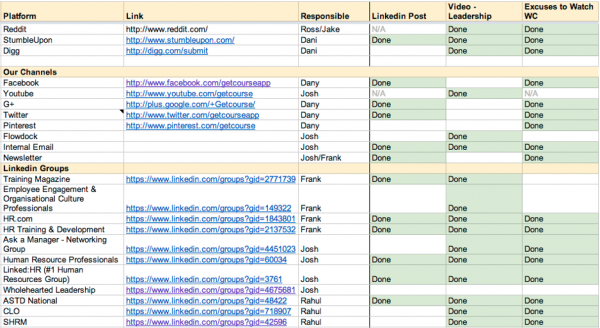 Start by making a spreadsheet of all your content creation team members and the groups that are most relevant to your content marketing strategy. I’ve included a sample Excel sheet I created, which you can use as a template. 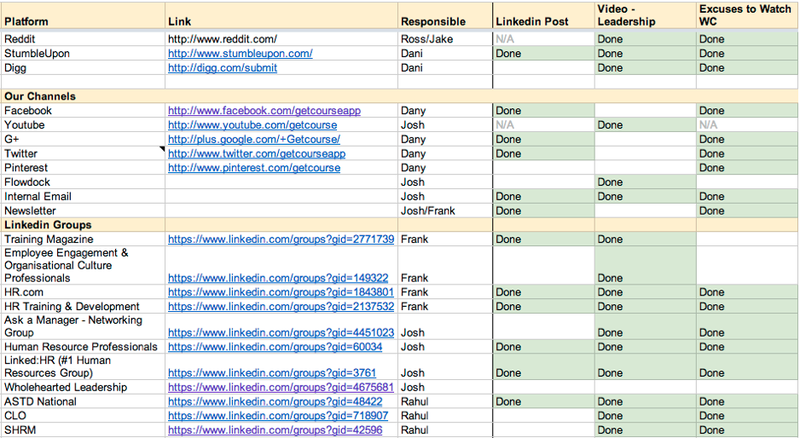 (As you can see, I’ve also included content for other social networks, such as YouTube, Reddit, and Facebook). 2. For each new piece of content you publish on your blog, your website, or anywhere else, mark down the LinkedIn groups that the article could be beneficial for. 3. In your posting, always try to ask a question or share a valid opinion on the content you post or comment on. Encourage your team members to get involved in the existing discussions on the group page as well to generate buzz around your post, specifically. By becoming active members of the community, your team will not only help your own content remain at the top of the group for much longer, their rankings as top influencers in the group will also be raised. 4. Make it a part of your strategy to respond to feedback. Save the marketing pitches for offline or private discussions with interested parties who you come across as a result of your conversations. But on the group discussions themselves, make sure you focus on creating a dialogue — not on promoting your products/services. 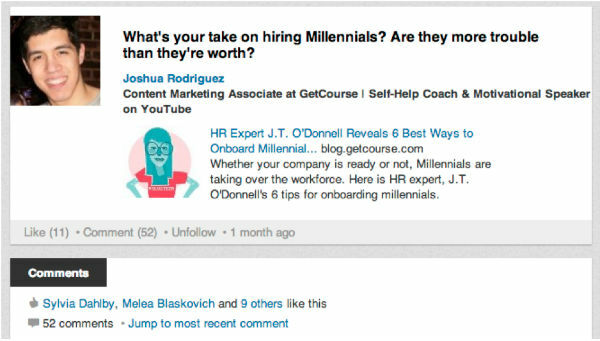 Find more tips for using LinkedIn Groups and other platforms to increase the impact of your content. Read our Content Marketer’s Guide to Social Media Survival: 50+ Tips. Josh is a content marketing associate who blogs about his video experiments and strategies at Trackbat. He tweets as @TheJoshSpeaks and creates self-help/ dating videos for young adults on his YouTube channel.